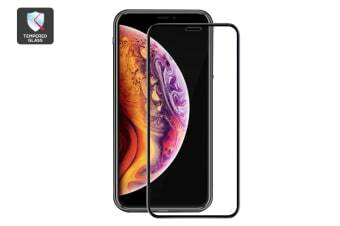 Protect your phone screen against everyday wear-and-tear from keys, coins and more with this Tempered Glass Screen Protector for iPhone Xs Max. Even micro-scratches can weaken a phone screen over time, making it difficult to view and more susceptible to cracking. But with an excellent tempered glass screen protector, you can enjoy the new-phone feeling for longer. The almost invisible design delivers superior protection without compromising on the look of your phone or the sensitivity of the touchscreen, while the anti-glare surface is easy to wipe clean, acting as a protective barrier against smudges, oil and water. Give your screen full protection with the 3D wrap-around shape and gummed finish, safeguarding all corners and edges of your phone.